got a very broad range of types of art; reproductions of manuscript pages, photographs from movies, illustrations by famous artists like Duerer and Boticelli, pictures from old children's books, modern photographs, and nearly everything in between. Art.com makes giclee reproductions in several different sizes that can be hung on the wall. You can choose to have them framed or unframed. One piece that I am sure people will enjoy is this one, Fighting Blades of Europe, by Dan Escott. If you are interested in antique weapons, your best bet is to search with French names, as they seem to come up the most often. Try "epee" (with the accent, preferably) for swords and "dague" or "poignard" for daggers. 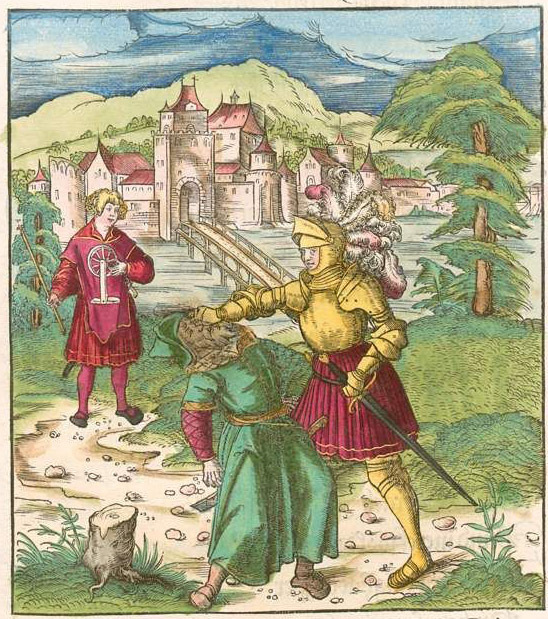 For those of you who like historic European martial arts, you can find prints of the Cluny edition of Liechtenauer's longsword. Try searching "Traite de Combat". If you just want to browse generally, search for "sword". Keep in mind that you find quite a few redundancies if you search this way. In the same vein, I've got a bunch of sources to share (these've probably already been linked elsewhere in the forums, but it doesn't hurt to have everything in one place). I've been reading up on Maximilian I and looking up shedloads of German art from that period (Altdorfer, Durer, Burgkmair, and so on). We have The Triumph of Maximilian I courtesy of the University of Graz. Click pictures to embiggen. The Munich Digitial Library (MDZ) has hundreds of thousands of digitised manuscripts; I've barely scratched the surface. Note that these can all be downloaded in PDF form. [BSB-Hss Cod.icon. 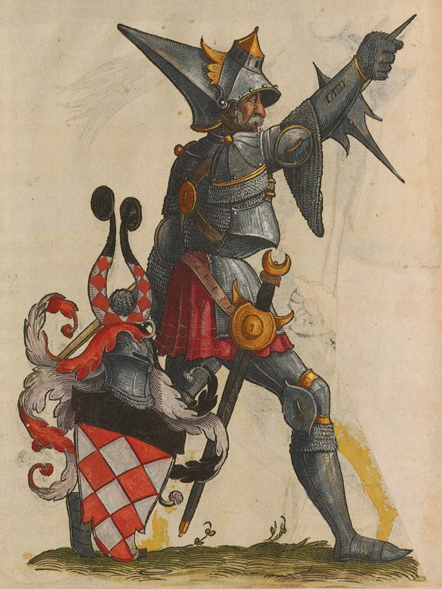 312 b] : The Genealogy Book of the City of Augsburg features page after page of parade armour illustrations (see below). Forget Dungeons and Dragons, this is what fantasy armour should look like! [VD16 M 1649] : Theuerdank: Watch Maximilian I allegorically mow down a forests' worth of animals and get a cannon set off in his face. 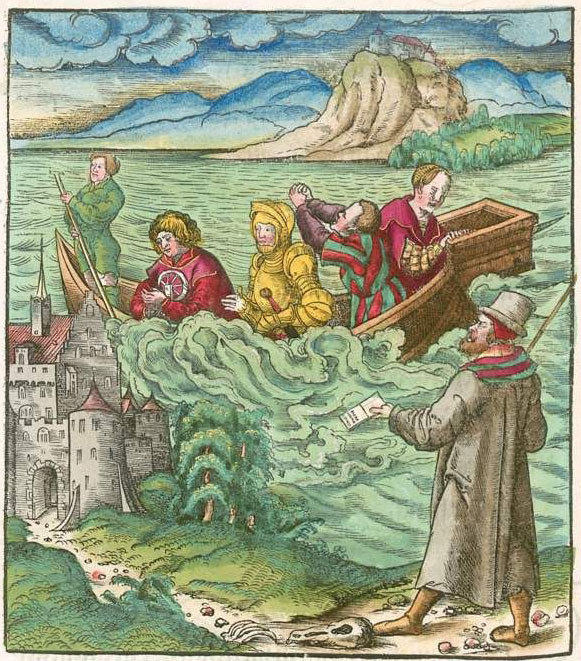 The Houghton Library Digital Medieval Manuscripts site likewise has plenty of stuff. Albrecht Altdorfer's The Battle of Alexander at Issus can be viewed at various levels of detail on the internet (1 2 3 4 5). I've not yet seen a really huge photo that'd do justice to the entire painting, but even so there's plenty of detail to study on the available images. Finally, the IMAREAL digital picture collection has been linked on this site before, but it bears mention again. Here's a link (previously posted by Samuel Bena ) to Der Weisskunig, Maximilian I's book of kingly advice. Notable for containing huge numbers of woodcut illustrations. NOOO! We've had our internet capped for the month! We should dedicate a whole thread to parade/fantasy armour! This raises some questions about the authenticity of the designs depicted. Did anything like this ever really exist? It looks like they were thinking "I wonder how much stuff we can fit into one panel?" And what's happening in that second one? It looks like he'spunching the guy in the face for no reason! That being said, that suit, whoa, I want it. I look for the explanation of the illustrations. Der Weisskunig (History of MaximilianI) is great book! And we know this illust very well. Tewrdannckhs Nurnberg 1517 [VD16 M 1649] is great book too! So Maximilian has his lance... But the bolt of the crossbow sticks in the head of his opponent.